Frankfort residents are already staking out the best viewing sites. Because on March 11 the Capital Plaza Tower, Frankfort’s tallest building and a longtime office of state government workers, is coming down. Before it implodes, a team of experts inside the deserted tower are making sure that there will be no release of harmful microscopic asbestos fibers into the air during the event. Asbestos is a silicate mineral fiber that is used in a variety of building materials such as ceiling and floor tiles, insulation, roofing shingles and cement products. Most asbestos products present little risk to human health if kept in good condition and not disturbed. Before a building is renovated or demolished, precautions must be taken to contain the asbestos fibers, as breathing them in can lead to an increased risk of lung cancer, mesothelioma and other lung ailments. “It wouldn’t be surprising to find asbestos in a building of that age,” said Jennifer Spradlin, an environmental control supervisor for the Division for Air Quality (DAQ). She leads a team that oversees asbestos regulation in Kentucky. “Asbestos was phased out of most building products by the 1990s’, but prior to that, it was commonly used for insulation, cement and many other materials,” said Spradlin. Kentucky has laws to protect human health and the environment from asbestos exposure. Those laws apply to asbestos disposal and the demolition or renovation of all non-residential buildings and some residential ones as well, depending on the number of dwelling units (see Asbestos Regulations below). Both state and federal regulations require asbestos to be properly removed and disposed of before the Tower can be demolished. Designed by Edward Durrell Stone & Associates, the 338-foot, 28-story building opened in 1972. It would come to house 755 people, comprising between four and seven state cabinets and offices, depending on the year. Even today, it’s the eleventh-tallest building in Kentucky. The state has considered closing the 46-year-old Capital Plaza complex for years due to costly maintenance issues and potential safety issues. A new office building will rise on the footprint of the Office Tower. CRM/DW Wilburn #2 LLC of Lexington, has been selected to design, build, finance and operate the new 385,500 square foot, 1,500-employee office building and 1,206 space parking structure. It is estimated that the demolition of the Office Tower and adjacent parking structures will generate approximately 67,000 cubic yards of concrete debris. The developer is bringing a concrete crusher on site to reuse virtually all this material as structural fill where both the Fountain Place shops parking and the tower parking structures are located. This is not only a cost-saving approach, but a responsible and sustainable approach as well. Eli Caudill is an environmental scientist and asbestos inspector for DAQ. When a building like the Tower is slated for demolition, it’s Caudill’s job to ensure that any existing asbestos is safely removed and contained. After the last of the building’s occupants moved out in 2017, the demolition company Renascent Inc., completed a final survey of the building to identify any suspect material. Once the survey was complete, Caudill walked through the building, inspecting any areas that might contain asbestos. Samples from remaining suspect material were sent to a lab for verification. Pipe insulation, fire doors, floor tile and associated mastic comprised the bulk of the asbestos material found. “It’s kind of like exploratory surgery,” said Caudill. “Sometimes you have to poke holes in the walls to get to the pipes or the insulation. A lot of stuff looks like asbestos, but isn’t.” The insulated lining of a boiler, for example, turned out to be a mixture of horse hair and fiberglass. With all asbestos identified and mapped in the survey, Renascent, used a certified asbestos abatement professionals to remove it. Generally, only material that is friable, which is material that easily releases asbestos fibers into the air when disturbed, poses a health risk during demolition. By law, asbestos must be removed by a specially-trained, certified asbestos contractor. It’s an involved process that can take weeks or months as workers take great care to prevent the microscopic fibers from being released into the air. 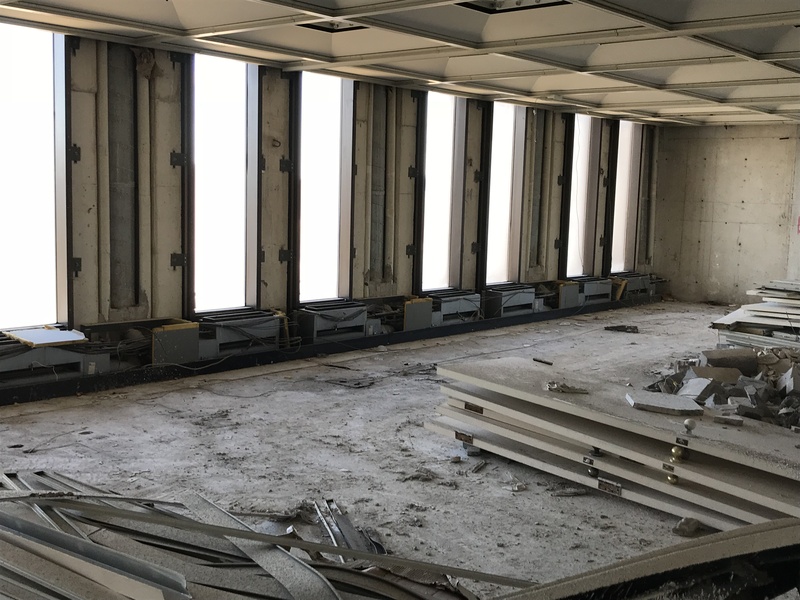 In early February, two months after contractors began the abatement process, Caudill did another walk-through of the cold, dark Tower to verify that all asbestos had been removed. With his flashlight in hand, he peered into exploratory holes poked in the walls, where sections of pipe had been removed. Caudill’s steel-toed boots made sticky sounds as they contacted the floor which now has been stripped of tile and carpeting. Lifting the door to one of the boilers, Caudill pointed to a gasket that looked suspicious. “If we even suspect it contains asbestos, it needs to be removed,” he said. With the asbestos removal nearing completion, demolition contractors are also salvaging materials that can be repurposed before the building is imploded next week. Step by step, the Tower is being stripped down to its bare bones. In the lobby and in the hallways, it is hard to recognize the once stately office building. Italian marble slabs that once lined the walls lay stacked in piles, awaiting a new home in the future office building that will be constructed on the site. Doors, flooring and interior room dividers are mostly gone. “It’s going to be sad to see it go,” said DAQ administrative specialist Ruthie Hall. Hall was only seven years old when her father worked as a project manager during the construction of the Tower. “When I was a kid, dad would point to the Tower every time we drove past it and tell us how he helped to build it. And that legacy has continued with my own children and grandchildren. Whenever I see the Tower, I think of my dad. I’m really going to miss it when it’s gone,” said Hall. When it finally comes down, spectators can be assured that the nearby air quality won’t be compromised and the event will be as safe as possible for human health and the environment. In addition, 401 KAR 58:040 regulates entities performing asbestos abatement. This regulation requires entities to be certified to perform asbestos abatement projects and establishes specific work practices for them to adhere to. With certification, asbestos abatement entities have the training and background to protect Kentucky’s environment and its citizens’ health and welfare. Please view the photo gallery for more on the Tower demolition at https://landairwater.me/2018/03/01/preparing-the-capital-plaza-tower-for-safe-demolition-photo-gallery/.